This has to be the best Doctor Who limited edition POP – ever. Dalek Sec portrayed with outer body open, revealing the new, evolving, Hybrid Dalek within. Dalek Sec was the leader of the Cult of Skaro an elite order of Daleks which also included Dalek’s Caan, Jast and Thay. Limited Edition. We are also seeing growing interest from European countries like Germany, France and Turkey. Some of the cutest WHO figures ever. Will You Buy Doctor Who Funko Pop Vinyl Figures? Got this the other day, it’s the best of the Dr Who pops! In my opinion. WAIT… Mine says UT Exclusive?! And i got it before the pre order date? What? 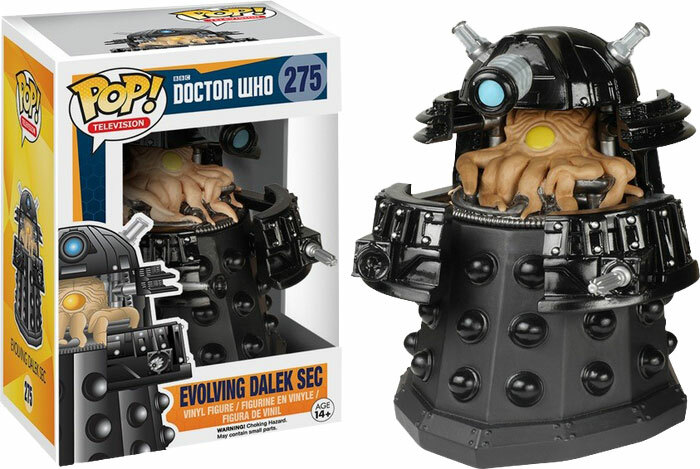 I was going to buy the normal Dalek Sec in FP the other day, now I reckon I’ll wait for this. Damn, I just ordered some stuff from forbidden planet and really don’t want to pay £5 postage just for this. Hope they get some in the shop in Belfast. Yey! I am so glad this is in the uk now! Has the free postage offer gone now? I ordered 2 from fpi and it was free p&p. Hmmm, I think I’ll cancel the one I’ve preordered from Game Stop. They have a UK Site so hopefully they will stock it there. I’m pretty certain it will come out in the UK though, all the previous one’s have. I can’t see them not releasing it here too much ££ to be made from collectors. I’ve just pre-ordered one of these expected 30th September 2015. It was $9.99 with $14.99 shipping to the UK. I paid with my debit card as PayPal wouldn’t work. Same! Why advertise Paypal payment if you can’t use it? Well that was a total waste of time! International Orders have to be paid by Credit card which you will get charged a transaction fee on. If paying by Paypal it then tell’s you they only ship to the USA. Duh? Yes, checked the UK site first. No mention of it upcoming or anything? Last time i looked on the bbc shop the release date was june, now its september?! Yeah, I had a email from FP saying last night that they’re coming in mid July.